Are Peacock Feathers Harmful to Cats? Peacock feathers supply hours of safe fun for you and your kitty. If your kitty has had the opportunity to play with a peacock feather, you've enjoyed a glimpse into her truest nature. She's programmed to zero in on fluttering, jerking movements, so peacock feathers can be the source of hours of fun. Fortunately, they are toys that aren't harmful to your cat. The inherent knowledge that birds are on her list of prey is what attracts Athena to play with feathers. She was made to hunt feathery creatures and the feathers they wear aren't harmful to her. It's true you may never have seen a cat take down a peacock; the bird would most likely win that fight. But that doesn't keep their graceful and gorgeous feathers from mesmerizing kitties. If you've decided Athena's next toy will be a peacock feather you should have no problem finding one. 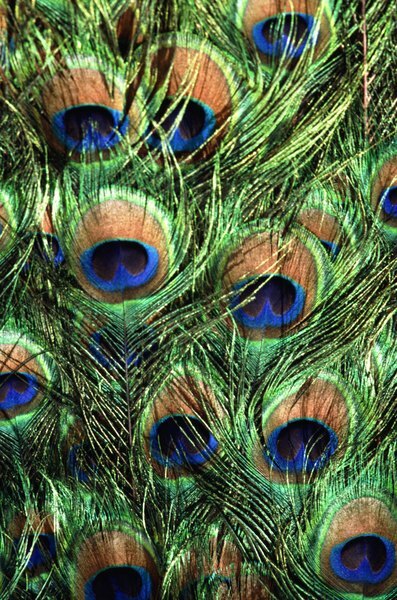 Some pet supply stores carry them since they're so popular with the feline set, but there are other places to procure peacock plumage. Craft stores and florist shops carry them and you might be able to find some at a farmer's market. The feathers without "eyes" on the tips usually don't sell well if at all, so you may be able to get a supply of them for free. Athena won't care about the eyes, she just wants to play. It probably seems basic to you, but a peacock feather isn't just a simple toy. It's an effective way to interact with your kitty and give her some exercise. Physical activity is vital for Athena on many levels; it helps increase her muscle tone, improves her circulation and can eliminate behavior problems by alleviating boredom and stress. Peacock feathers have even become a professional tool of sorts, finding a place in official cat shows: when a judge comes across a particularly aloof feline, a few flicks of a peacock feather elicits a response every time. A peacock feather is an especially enjoyable toy that could become Athena's favorite. It's not one that she can play with by herself, though. She needs you to animate it, making it flit and dance and jerk in a life-like way. Put it away after play time is over to reduce the chances of her chewing on and swallowing part of the feather. Eating bits of feather won't harm your kitty, but gnawing on and shredding her feather will ruin it. Peacock feathers will last much longer if you don't allow Athena to have her way with them unsupervised. Why Do Birds Need Downy Feathers? What Does It Mean When Parrots Puff Up Their Feathers? Do Cockatiels Normally Sleep With Their Feathers Fluffed? What Causes a Parakeet to Lose Feathers?